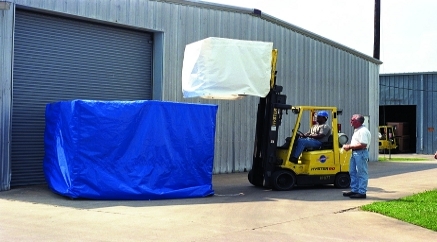 Pallet Covers - Custom Pallet Cover | Reef Industries, Inc.
Use Reef Industries’ patented Griffolyn® pallet covers to reduce packaging, shipping or storage costs of valuable goods. Griffolyn® products are lightweight, flexible, cold-crack and moisture resistant and provide continuous protection all year round. Manufactured using a UV stabilizing process, Griffolyn® helps to protect your investments from sun degradation commonly associated with long-range outdoor storage and shipping. Custom-fitted Griffolyn® pallet covers are reusable and also available in fire-retardant and anti-static grades allowing you to make the most of your warehouse space and to store pallets, drums, cable reels and various machines outdoors, freeing up valuable warehouse space. Reef Industries, Inc. offers custom manufacturing and fabrication tailored to meet your specifications with availability often in 10 days or less. A wide range of colors, material grades, custom printing and additional features such as anti-static, corrosion inhibitors and heat shrinkability are also available. A-20 is a fire retardant, woven HDPE scrim with a polyethylene coating on both sides. Meets or exceeds NFPA 701 LS/SM. Griffolyn ® Type-55 FR is a 3-ply laminate combining two layers of fire retardant low density polyethylene and a high-strength cord grid. It is specifically engineered to provide high strength and durability in a lightweight material.